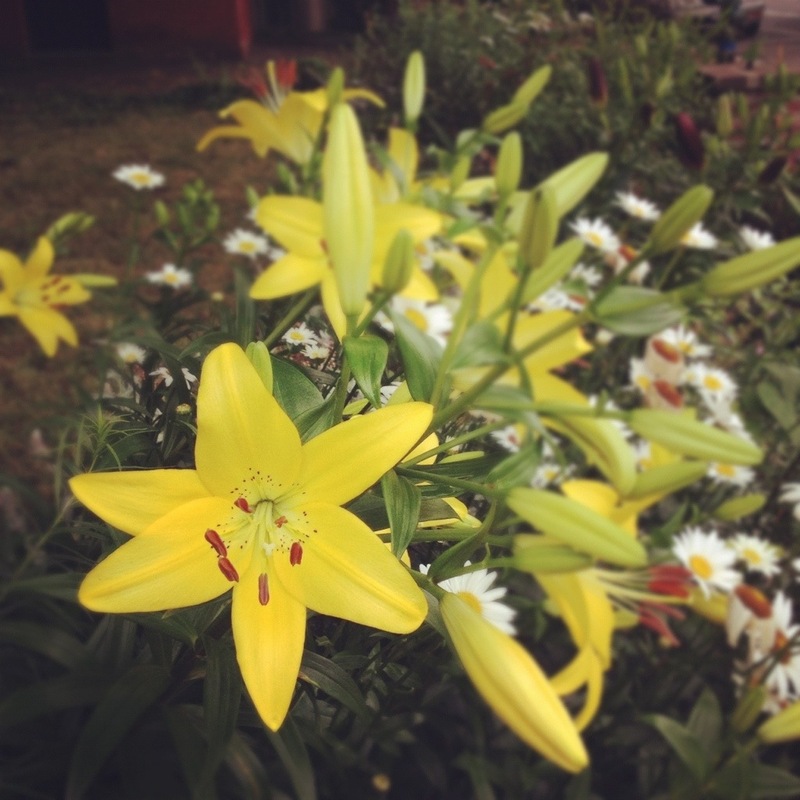 Giant, gorgeous lilies along my daily commute. 1. Empty my Instapaper queue. I have upwards of 250 articles saved at this point and would like to clear it by actually reading many of them, rather than just throwing up my hands and deleting. 2. Make a lot of pesto. My basil is already going gangbusters, as it did last year, but rather than letting it get overgrown and bitter before I harvest it, I’d like to stay on top of it and make enough pesto to get me through the winter. 3. Start swimming again. Like, for real this time. Every time the summer Olympics come around, I am reminded how much I used to love swimming when I was in middle/high school and vow to get back to the pool. My urge to swim started early this year, however, in talking with my sister-on-law about my nephews joining the neighborhood swim team this summer. There is a free indoor pool at Eastern Market, so it’s not as if it’s inconvenient – I just need to stop being a lazy schlub. 4. Have more picnics. Whether it’s lunch in Dupont Circle or Friday night at Yards Park (which is happening this very week, as a matter of fact), I’d like to do more of my eating in the sunshine this summer. 5. Get a kitten. Maybe. I’m still a little on the fence about whether I want a cat again, and decided to wait until after the Alaska trip to make the decision, because I figured leaving a kitten home for three weeks – even with daily visits from my pet-sitting friends – sounded like a recipe for disaster. 6. Keep my garden alive. I have a bad habit of losing enthusiasm for my garden mid-summer and letting it get all dead and gross. 7. Re-declutter my apartment. A couple of years I went on a bit of a decluttering tear, but over time, extraneous things have crept back in. Or maybe they’ve bred in the closets. Either way, it’s time to take a couple of boxes of stuff to Goodwill. 9. Go to a Caps summer scrimmage. I had a ton of fun going to a rookie camp scrimmage last summer, so I’m thinking I’d like to make it an offseason tradition. 10. Decide the thing that needs deciding. Apologies for being cryptic, but I’m not ready to put this one out on the Internet yet, but wanted to give it a placeholder. 1/ Loose 10 (more) pounds – by walking at least 1.5 miles a day/5 days a week to & from the pool and then swimming. This would, finally, get me back to my pre-James weight (which is coincidentally my wedding weight, ten years after the fact). 5/ Insurance paperwork – both from the fire and from our health insurance – I just need to get on top of it and stay on top of it! 6/ Get reorganized electronically – we’ve finally purchased new computers, now I just need to get a system set up for filing and storage; this will also help me get a better sense of what survived (fall 2009 to present) and what is lost especially in the photographic realm. 7/ Pick paint colors for the interior of the house. We have the basic wall and trim colors selected, but now we need to pick colors for the rooms we want to make different (our bedroom, James big boy room, the dining room, etc.) and while this seems like it should be fun and easy, its so not! 8/ Design James big boy room for the new house. I really want to get this right and make it fun, but not over the top (I don’t want to invest too heavily in a theme that can’t be changed with some paint and new linens). 9/ Go to Canton trade days (www.cantontradedays.com), and the Round Top summer antiques show (www.roundtoptexasantiques.com) to see if we can find any treasures for the new house – at a bargain! 1. Say goodbye to Allie and Semo (oldest living dolphin in captivity, apparently most dolphin trainers in the country know or have worked with him). Our zoo is getting remodeled, and the dolphins are being permanently relocated. 3. Get to Fort Snelling when they fire the cannon. 4. One geocache per week. 5. Train for an upcoming Duathlon I’ve registered for. Spraining the knee put a big kibosh on most of my training to date. 6. Each of us wants to take an online course. I will lump this with the “summer school” enrichment for the kids…oh and there will be 4 kids (gulp). 7. Camping. It’s a lot of prep work, but empowering on many levels. 8. Freezer jam. This is the first time in several years that we have run out and I’ve had to buy jam. At the rate we go through PB&J, I guess we need just over 1 jar per week to make it until next season. 9. Clean out the basement and craft room. I think this was on last Summer’s list,but it did not happen. It needs to happen prior to 2013. 10. Found a dirt cheap open swim about a mile away. It’s indoors. Would like to do some afternoon bike trips (again, 1/week) to enjoy this. It’s as close to a “Hampton Pool” experience as we’ll ever be able to get. Fabulous memories from when ALL of us were together….